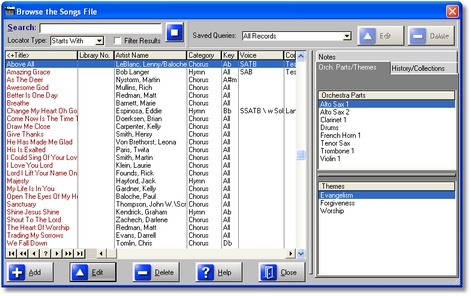 A church can use this program to maintain all of the churches music, performance history and copyright obligations. Manage the music library, the song collection regardless of recording medium, ensemble members, worship order for multiple performances, and keep performance history of all ensembles, individuals, songs, and collections. Maintain choir members contact information and participation. Maintain an equipment inventory. Lastly an inventory of the instruments and equipment can be maintained along with a detailed history of repair and maintenance. Some of the data for each song is: title, artist, composer, arranger, orchestra parts, custom alphanumeric library number, and the copyright administrator. Enter any number of themes into a search list for later access. Enter lyrics for each song and print them at any time, including exporting to Microsoft Word. Maintain the churches music library. Enter the type of storage medium, custom library number, title, arranger, composer, publisher, cost, when purchased, list orchestra parts, and more! In addition to the basic information of name and address the following can be saved, is the person a vocalist, soloist, what voice part, do they play an instrument, if so what instrument. Personal data like birthday, and attendance. Enter all the ensembles the person belongs and their level of stewardship. Qweas is providing links to RCL Music Ministry 8.0 as a courtesy, and makes no representations regarding RCL Music Ministry or any other applications or any information related thereto. Any questions, complaints or claims regarding this application RCL Music Ministry 8.0 must be directed to the appropriate software vendor. You may click the publisher link of RCL Music Ministry on the top of this page to get more details about the vendor.